Bills Cottage in Turkdean, near Northleach sleeps 6 people. 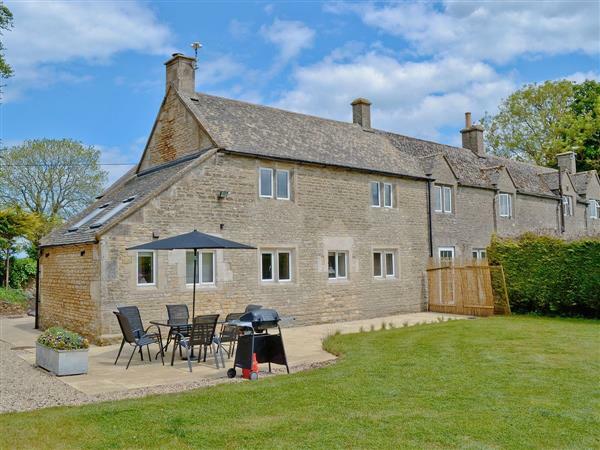 Located on the outskirts of the rural hamlet of Turkdean, near Northleach, this Cotswold stone holiday cottage has been beautifully renovated throughout. The cottage offers wonderful views across rolling countryside and is located within the grounds of a working farm, where there are an abundance of animals and wildlife. There are many nearby honey-coloured villages well worth a visit including Bourton-on-the-Water, Stow-on-the-Wold, Moreton-in-Marsh, with its famous Tuesday market, and Chipping Campden. The city of Gloucester, with its magnificent cathedral and tomb of Edward II, is within easy reach, as is the Regency city of Cheltenham and its famous racecourse. National Trust properties are abound, including Snowshill Manor and Woodchester Park. For horticultural enthusiasts there is Westonbirt Arboretum, Kiftsgate Court and Hidcote Manor. The Cotswolds offer many countryside walks and bridal ways. Shop 2½ miles, pub and restaurant 1½ miles. Ground floor: Living room. Dining room/kitchen with flagstone floor. Utility room. Shower room with toilet. First floor: 3 bedrooms: 2 double (5ft), 1 twin. Bathroom with shower over bath and toilet. Woodburner in living room (initial fuel included). Oil central heating (underfloor on ground floor), electric underfloor central heating (first floor bathroom), electric, bed linen and towels included. Travel cot and high-chair on request. Four Freeview TVs. DVD. Electric cooker. Microwave. Washing machine. Tumble dryer. Dish washer. Fridge/Freezer. Enclosed garden with patio, sitting-out area and furniture. Gas Bar-be-que on request. Ample parking. Cycle store. Pet free of charge. No smoking. Holidays run from Friday to Friday. For a better idea of where Bills Cottage is, you can see Bills Cottage on the map below. Bills Cottage is in Gloucestershire; should you be on the lookout for a special offer, you can find all the special offers in Gloucestershire. It's always worth checking to see what is on offer at the moment. Do you want to holiday near Bills Cottage (28946), you can see other cottages within 25 miles of Bills Cottage; have a look to find your perfect holiday location.